Astronomers have found the most distant water yet seen in the Universe, in a galaxy more than 11 billion light-years from Earth. 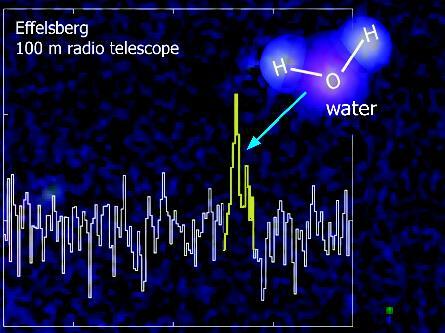 Previously, the most distant water had been seen in a galaxy less than 7 billion light-years from Earth. STScI, CFHT, J.-C. Cuillandre, Coelum. Using the giant, 100-meter-diameter radio telescope in Effelsberg, Germany, and the National Science Foundation's Very Large Array (VLA) in New Mexico, the scientists detected a telltale radio "fingerprint" of water molecules in the distant galaxy. The soggy galaxy, dubbed MG J0414+0534, harbors a quasar -- a supermassive black hole powering bright emission -- at its core. In the region near the core, the water molecules are acting as masers, the radio equivalent of lasers, to amplify radio waves at a specific frequency. The astronomers say their discovery indicates that such giant water masers were more common in the early Universe than they are today. MG J0414+0534 is seen as it was when the Universe was roughly one-sixth of its current age. At the galaxy's great distance, even the strengthening of the radio waves done by the masers would not by itself have made them strong enough to detect with the radio telescopes. However, the scientists got help from nature in the form of another galaxy, nearly 8 billion light-years away, located directly in the line of sight from MG J0414+0534 to Earth. That foreground galaxy's gravity served as a lens to further brighten the more-distant galaxy and make the emission from the water molecules visible to the radio telescopes. "We were only able to discover this distant water with the help of the gravitational lens," said Violette Impellizzeri, an astronomer with the Max-Planck Institute for Radioastronomy (MPIfR) in Bonn, Germany. "This cosmic telescope reduced the amount of time needed to detect the water by a factor of about 1,000," she added. The astronomers first detected the water signal with the Effelsberg telescope. They then turned to the VLA's sharper imaging capability to confirm that it was indeed coming from the distant galaxy. The gravitational lens produces not one, but four images of MG J0414+0534 as seen from Earth. Using the VLA, the scientists found the specific frequency attributable to the water masers in the two brightest of the four lensed images. The other two lensed images, they said, are too faint for detecting the water signal. Water masers have been found in numerous galaxies at closer distances. Typically, they are thought to arise in disks of molecules closely orbiting a supermassive black hole at the galaxy's core. The amplified radio emission is more often observed when the orbiting disk is seen nearly edge-on. However, the astronomers said MG J0414+0534 is oriented with the disk almost face-on as seen from Earth. "This may mean that the water molecules in the masers we're seeing are not in the disk, but in the superfast jets of material being ejected by the gravitational power of the black hole," explained John McKean, also of MPIfR. Impellizzeri and McKean worked with Alan Roy, Christian Henkel, and Andreas Brunthaler, also of the Max-Planck Institute; Paola Castangia of the Max-Planck Institute and the INAF Astronomical Observatory of Cagliari in Italy; and Olaf Wucknitz of the Argelander Institute for Astronomy in Bonn, Germany. The scientists reported their results in the December 18 issue of the scientific journal Nature.